Perfect holidays' gift choice for Birthday, Anniversary, Wedding, Thanksgiving day, Christmas etc. 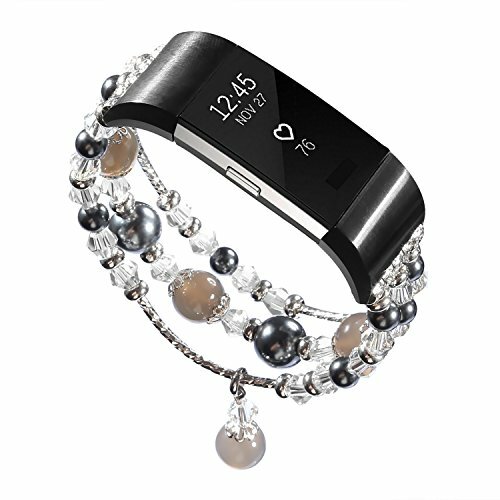 Stainless steel for the connector part, Faux Pearl crystal beads, Durable elastic rope,Smoothy Beads; Charming Artificial Crystal.This listing is for the replacement strap only, Fitbit watch is not included. the recommended wrist size is between 5.7 inches to 6.9 inches; For larger or smaller wrists it is possible too tighten or loosen the elastic cords. We committed to give all customers an excellent shopping experience, if you have any questions or problems, please feel free to contact us. we will reply to you within 24 hours and we will do our best to achieve 100% in customer satisfaction. ★【Size Note】Elastic rope design for fixed wrist size. The recommended wrist size is between 5.5 inches to 7 inches. For larger or smaller wrist, maybe it works too tight or loose. So please measure your wrist size first. ★ 【Durable Material】Made by exquisite plated metal, beaded pearls and colorful crystals. Connected by elastic rope. Strap length is flexible and elastic. A long durability and endurance. ★ 【Easy Installation】Designed exclusively for Fitbit Charge 2 Watch. Two high quality stainless steel connectors seamlessly fit with Fitbit Charge 2 watch, fix the fitbit charge 2 securely. Easy to install or remove. No tool is needed. Comfortable to wear. ★ 【Wide Application】Work for both casual and special events. Suitable for holiday parties. A perfect gift/present for Wedding day, Birthday, Valentines' day, Christmas, Thanksgiving Day etc. Bring you tons of compliments. ★ 【Why choose our bracelet?】Out-of-date to wear a stainless steel or leather watch bracelet in a party. Without suitable bracelet to fit for your dressy clothes? This bracelet will solve your problem. It will incredibly enhance your charming and elegance. Make your Fitbit Unique,Fashionable and Classy! If you have any questions about this product by IMYMAX, contact us by completing and submitting the form below. If you are looking for a specif part number, please include it with your message.